Aside from being cool to look at, dice tattoos express an individual's feelings on luck, risk, fate or gambling. They also can symbolize a hard or dangerous lifestyle. All tattoos are deeply personal, making body art a powerful form of personal expression. After all, this type of dice art is permanent ink on your skin. Tattoos of dice are popular in American culture today. However, the history of tattooing reveals that Western culture initially regarded tattoos with suspicion and disgust. If you're going to get inked, get a great tattoo. If you're here, you're obviously off to a good start. Take a few minutes to do some research on design ideas for dice tattoos. Tattoo designs will pair dice with cards, skulls, attractive women, stars and powerful symbols of luck (shamrock) or misfortune (eight ball). Need a place to start? A few images to get your imagination revved up and excited for your new tattoo? Browse the images online at popular tattoo galleries. Best of all, it is free to look! How would you like to "try on" a tattoo before actually getting inked? Now you can for free with the innovative web site, TatMash. Take a tattoo of dice, upload a photo of your arm (for example) and the site will combine the two for you. Interested in tattoos of many sided dice? The Ink Nerd blog has a great post on tattoos of d20 dice. You'll find photos AND links to even more sites and blogs with dice tattoo info. Need info on tattoos? If you're new to body art and have questions about getting inked, read the article "Body Art Basics for the Beginner" for lots of good information. Tattoo beginners pick up a copy of a the Ink: The-Not-Just-Skin-Deep Guide to Getting a Tattoo. The book explains how to be safe and health conscious, compare tattoo artists and find a shop. Before you get your tattoo, take a moment to review this free handy checklist and also read about tattoo pricing. You also need to know how to take care of your dice tattoo immediately after getting inked. There's a step by step guide to help you with tattoo aftercare. Take care of it properly from the beginning and your body art will look beautiful and vibrant for years. Have you considered a temporary tattoo? These are a good test of a tattoo design to see if you'd like to make it permanent. 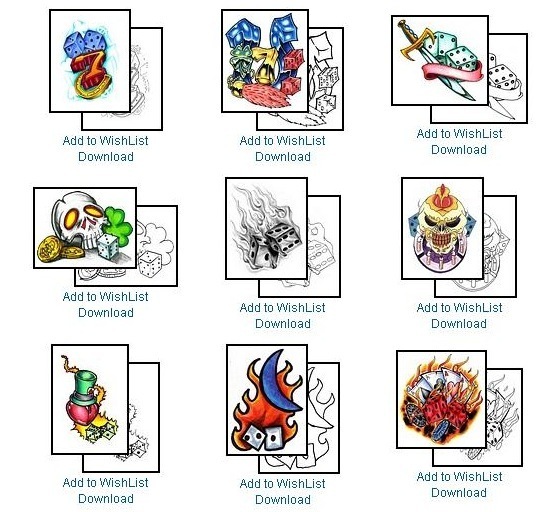 In fact, you can create a temporary tattoo by uploading your own design. Here's a great idea for temporary tattoos: Lost and Found identification for children. I realize this isn't exactly on topic for a web page about dice tattoos. I hope by mentioning Tattoos with a Purpose that it will help one more child find their way back to their parents safely. Consider this product when taking your kids on vacations or trips to large events like fairs, amusement parks or 4th of July festivals. Of course, temporary tattoos are also meant to be fun. You'll find temporary dice tattoos symbolizing luck as well as more racy casino and gambling designs. Another design combines dice with a horseshoe and a sparrow. If your luck has run out, then you may choose a bad luck design instead. 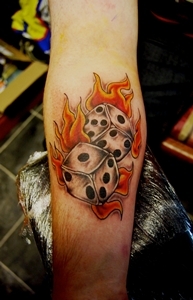 The flaming dice image creates a memorable tattoo. Popular images of dice in flames also decorate jewelry, t-shirts, caps and more. Still looking for more? That's cool. I found more. I'll first recommend that you look at this collection of 40 photos of gambling tattoos. It is free to look (no login required either). You'll see pictures of excellent gambling tattoo art on various body parts. 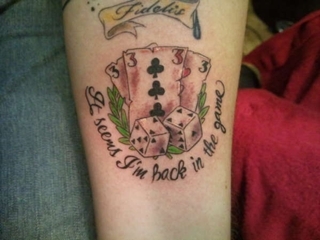 The tattoo designs blend dice with playing cards, lucky number 7, horseshoes, stars and more. Here are more excellent examples: A tattoo of flaming dice with skulls and a half sleeve tattoo of flaming cards and dice. 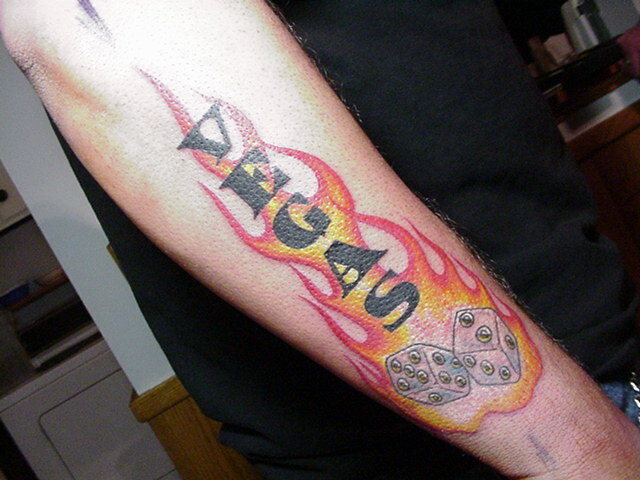 Finally, you can gaze at one man's devotion to Las Vegas with a flaming dice tattoo.